For those of you who do not know us, my name is Debbie and I am the proud Mom to Charlene, 17, GA1. Char was diagnosed at 8.5 months old after a metabolic stroke. This left Charlene absolutely listless. She lost all of her motor skills, including being able to drink a bottle. Char went through many years of struggles and surgeries. In August of 2005, Charlene had a tracheotomy at the AI DuPont Hospital in DE. She was put on a ventilator at this time. After this surgery, it took Char a long time to recover. 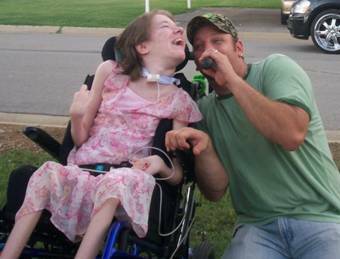 The following summer we took her to see her favorite country singer, Trace Adkins in Nashville TN. I noticed Char’s breathing was better and started making plans to move here! We moved in August of 2006 and have been here since. Charlene is still the happy go lucky girl she has always been. She has not needed any more major surgeries. Char has been off of the vent for about 2 ½ years now. She is a junior in high school and loves it! She has wonderful nurses who accompany her to and from school. Charlene’s major issues lately have been bed sores. She had a really bad one at the bottom of her spine, which is now closed up. On our last appointments with her pediatrician, neurologist, and plastic surgeon they told us there is no need to keep coming back unless we have an issue! Her pulmonologist said we can see him annually instead of every six months! She is doing excellent in all areas! Of course Char still has no real motor skills to speak of but she can laugh, smile and enjoy life like no one I know! I am curious as to any children older than her in the same condition. I just do not know what to expect next. Char has had a baclofen pump for almost ten years now. This has greatly helped with the spasms! She has a feeding button, trache, has almost no motor skills, and cannot talk.